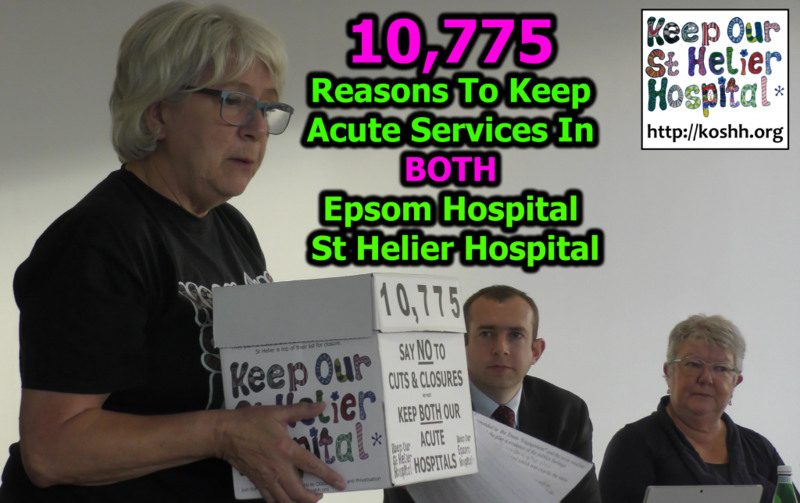 The Keep Our St Helier Hospital Campaign (KOSHH) has been gathering signatures from people who support its petition to keep all services at our local hospitals. They were given by many thousands of people engaged at street stalls and other events. This petition was presented to Clinical Commissioners on 30 November 2017. It demonstrates there is strong public opposition to Epsom and St Helier Trust’s plan to remove all acute services from both its hospitals. The SW London Sustainability and Transformation Plan proposed cutting the number of acute hospitals from 5 to 4 or 3. The Trust has carried out an “Engagement” to gather public support for their seeking permission to borrow £300m to £400m and build a single new acute facility somewhere. This reduced single-site provision would replace all acute services currently provided at their two major acute general hospital sites (ie Accident and Emergency, Consultant-led Maternity, Emergency Medicine and Surgery, Intensive Care, Cancer Care, Coronary Care, and in-patient Children’s Care). The questionnaires were vague, highly slanted and seriously misleading. Neither the questionnaires nor the presentations highlighted the fact that the new facility, if built, would reduce the number of acute facilities from two to one. The Trust denied the fact that their plan would mean significant delays due to longer journeys for emergency treatment and would therefore increase danger to patients. They were able to provide no evidence that reducing the number of sites providing A&E and Consultant-led Maternity would lead to better outcomes. They did not make clear until after the end of the engagement that the scenarios they presented involved reducing the Trust’s catchment area, with a reduction of up to 40% in the number of people the Trust would continue to serve. They did not cover how the other local hospitals would be able to accommodate the additional patients that the Trust would “disown”. They failed to offer the option of a costed plan for bringing the current premises up to standard. During the Trust’s Engagement many members of the public received the impression that they were being offered an additional facility, or even an additional hospital. Despite their having misled the public in these and other ways, only 441 people signed to give support for their bid for a loan. In contrast, KOSHH has obtained almost 11,000 signatures giving unqualified support of our petition. 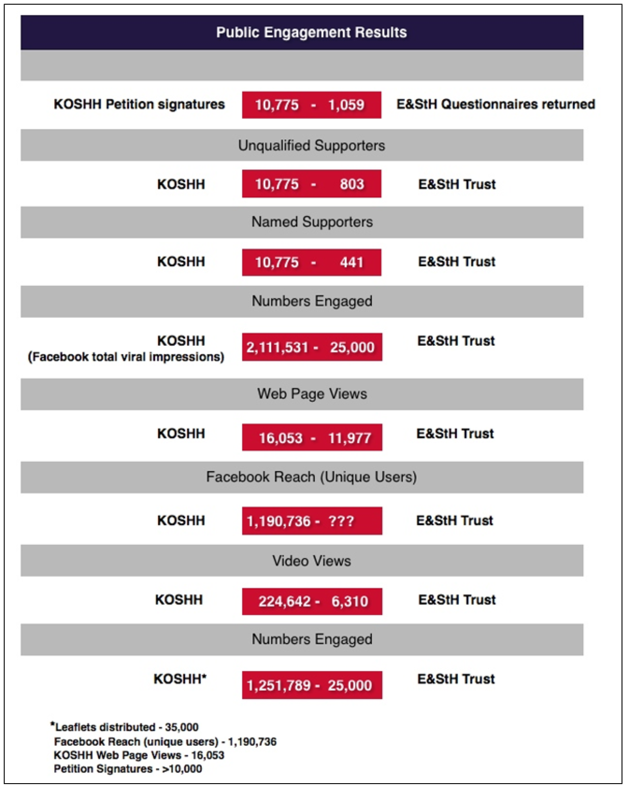 KOSHH has also succeeded in engaging with vastly more members of the public than the Trust has, as can be seen in the “Scorecard” below. KOSHH has also obtained, alongside signatures on our on-line petition, a vast number of comments expressing strong opposition to the Trust’s plan and support for our plea to the Clinical Commissioners. These will be published on our facebook and website platforms.